Could be used for many different applications. It was originally designed for tank truck hauling of hazardous materials. 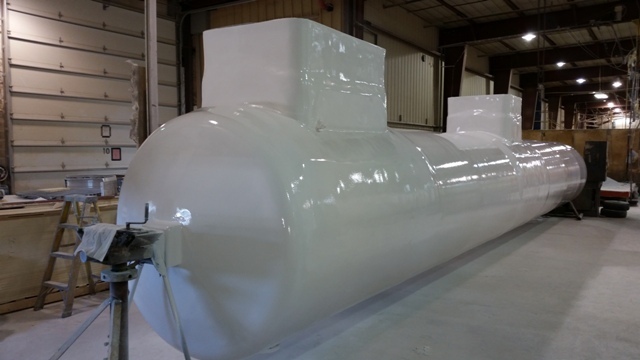 This tank could be used on a tanker trailer, or a fixed tank above ground or below ground. GPI can modify if needed by purchaser. This tank would be suitable for many materials contact Brian Zinser at GPI 715-359-6123 to verify your material is compatible. This is a new tank never been put into service. We are the manufacturer we can modify this unit to suit your needs. The specifications of this tank are as follows. This FRP tank is intended to transport products authorized by the Hazardous Material Table (49 CFR 172.102) and compatible with the inner corrosion barrier employed. The liner/Corrosion barrier is a FRP laminate from one ply of Vinyl Ester Resin saturated C-glass veil against the process surface. The resin-rich veil ply of the corrosion barrier contains approximately 90% resin by weight, making them effective barriers to permeation and corrosion. Veil is followed by chopped strand mat and resin. 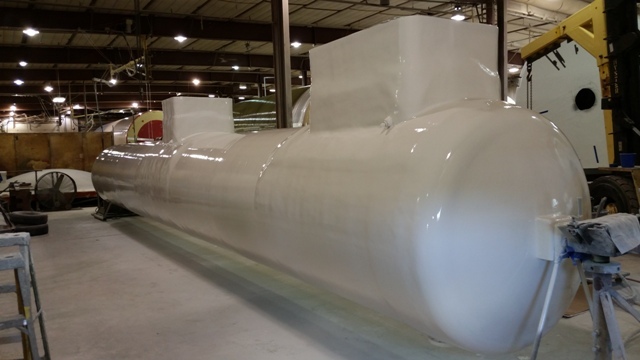 This second layer contains about 70% -75% Vinyl Ester Resin by weight, and also functions as a permeation and corrosion barrier. The high resin content of the corrosion barrier effectively shields the structural laminate from chemical attack.